There is an interesting episode related further down this page - Gervas was a life-member of the Achilles Club, and always took an interest. In 1958 he wrote to the other eight members in Northern Rhodeisa with an interesting proposal. See below. Text below in blue is by kind courtesy of Paul Willcox, Hon. Sec. of the Achilles Club. 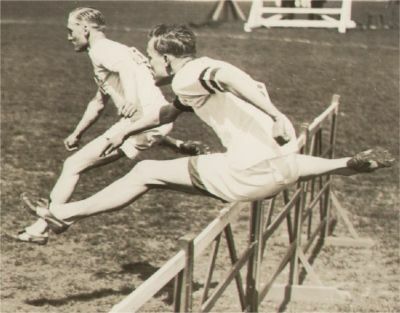 The trophy between Gervas' feet (a baton with engraved silver bands), signifies his part in Oxford's win in the 4 x 120y hurdles in the Oxford v Cambridge Relays match. The trophy (on which Gervas' name can be found) is still awarded annually. 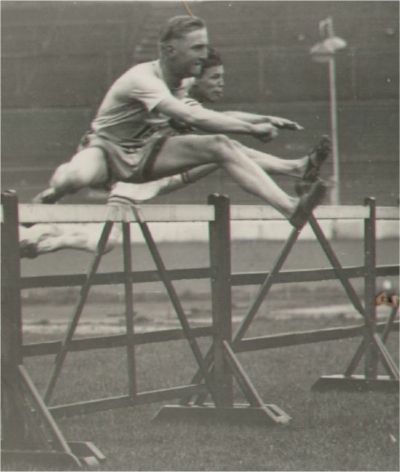 He competed in early 1930 before setting sail for Africa, placing 2nd at 120y hurdles for Achilles v Sussex at Brighton on 21st May and 3rd at 440y hurdles and 2nd at 120y hurdles v Atalanta and the Universities Union at Birmingham on 24th May. Gervas's medals and cups are held by Eric Clay, the son of Gervas's youngest son Crispin. Eric lives near - erm - Cambridge. Like myself you will all of you have received recently the 1956 Annual Report of the Achilles Club with list of members. From this list it appears that there are at least nine members of the Club in Northern Rhodesia and I believe there may well be more. (If you know of other members please send me their addresses so that I can contact them). 2. It has seemed to me for some time that we members of the Achilles Club should organise ourselves to do what we can to further athletics in this country in which we are now living. I have always hoped that one day an Oxford and Cambridge Athletic team might visit the Federation and that we members might give a party for the visiting team and I hope that this will happen one day. Meanwhile I believe the time has come for us to take a more active part, as local members of the most famous athletic Club in the world, towards the furthering of athletics in N. Rhodesia. 3. I hope in reading this letter you will appreciate that I am writing from the strictly athletic, and non-political, standpoint! 4. No country, in these days of acute international competition, can afford not to be represented by the best amateur athletes it can produce. If at some future date we could persuade "athletics" to break away from the Union of South Africa, we could ask for and obtain the holding of the Empire Games within the Federation. 5. I do not think that there is much hope today of holding open competitions between black and white, though both are now catered for to some extent by their own meetings. 6. I do believe the time has come to encourage both white and black to take an interest in the others' performances as a first step towards producing an athletic team for competition in international contests, without regard to colour, such as the Olympic and Empire Games. 7. 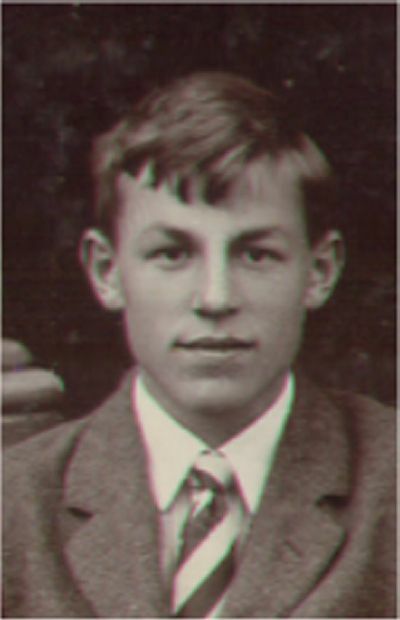 I have given the matter a great deal of thought, and I believe that we should give a trophy for a schoolboy competition between towns on a relay basis between teams of four, two of whom would be European and two African. That is each team would consist of a maximum of 20 boys of whom two in each event would be European and two African. Teams would be arranged in order of running according to athletic requirement and not colour. 8. The effect of such a competition would be to have crowds of supporters shouting encouragement for their team regardless of whether the runner was black or white. It would mean that the schools themselves in each town would take an interest in the sports of the school of the other colour, and that competitors would have to meet beforehand and practise baton-changing together. Because the boys would be of an average age of 18 or so, they would be able to bring some pressure to bear on their parents to let them take part, where the parents might have strong colour-bar feelings. The boys would want to make the team and have the outing. 10. You will of course remember that Object 2(c) of our Constitution is "to encourage relay and team racing." (a) You approve of the idea? (b) You will support me in organising such a competition? (c) You would prefer to subscribe locally for a trophy to be given by us, or to ask our parent body the Achilles Club -to -donate a trophy? (d) Whether you know of any other members of the Club in N.R.? Sent to the following eight people – Gervas was the ninth NR member of the Achilles Club. c/o The African Education Dept. I have found no other documents related to this, not a single reply.